Australian bred mare Better Life confirmed her position as the top middle distance horse in Singapore on Sunday when winning the country’s richest domestic race in style, the Group 1 Singapore Gold Cup over 2200m. Better Life ($150,000 2010 Easter, 4m Smarty Jones-Quiet Life) was making her first attempt at a trip further than 1600m following a last start victory in the first leg of Singapore’s Triple Crown, the Group 1 Kranji Mile, but she was too good for her opposition over the longer trip today. Jockey Alan Munro had the top class mare travelling well midfield during the S$1.35 million feature event and when given clear running down the long Kranji straight she swept past her rivals to a length victory over Maurice Utrillo with favourite Deep Pockets back in third. “She’s got an engine,” said Munro. “I got to the front probably too soon on her but I could hear the others screaming behind me so I thought I had them covered. Better Life was sold for A$150,000 from Torryburn Stud’s draft at the 2010 Inglis Australian Easter Yearling Sale. 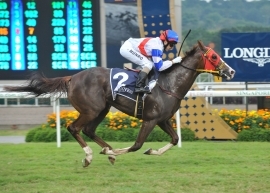 Today’s win took her earnings past S$1.2 million from only 10 starts for six wins and two placings. By Kentucky Derby winner Smarty Jones from Sunday Silence mare Quiet Life, Better Life was bred by Jananth Pty Ltd to be a top class middle distance horse and that is exactly what she is delivering for her owners the Suzuka Racing Stable and trainer Hideyuki Takaoka. Today’s win was Takaoka’s fourth victory in the prestigious Gold Cup in the last five years. Takaoka now has his sights on next July’s Singapore Derby (2000m), a race he won with another mare Jolie’s Shinju in 2009. “I’m just lucky, this horse can handle any distance,” Takaoka said. In addition to some valuable gold trophies Better Life’s owners were also presented with a bonus S$50,000 cheque from the Singapore Turf Club for winning two legs of the Singapore Triple Crown, the Kranji Mile and Gold Cup. Better Life’s connections are no doubt buoyed to return to the sales source of the dual Group 1 winner, the Inglis Australian Easter Yearling Sale, especially in the knowledge that her half-sister by High Chaparral will be offered from Torryburn Stud’s draft at next year’s sale in Sydney on April 9 to 11.